From the red carpet to the runway, tassels earrings are everywhere! While tassels may not be a brand new trend, it’s one that looks likely to last. A core staple of the Oscar de la Renta accessories collection each season, and seen in the jewellery collections of Chloé, Gucci, and Kate Spade, the tassel earring makes the perfect fashion statement. A simple way to add some drama to a simple evening look, teamed with everything from an LBD to a crisp white shirt, or for elevating a casual jeans outfit to take you from day-to-night. Tassel earrings also make an easy go-to accessory to wear with this-season’s off-shoulder Bardot tops. Inspired by Pippa O’Connor’s stunning Oscar de la Renta black beaded earrings worn at this year’s VIP Style awards, we have put together a collection of tassel earrings in 13 vibrant colours perfect for the budget-concious fashionista who wants Pippa’s ultra-glam look without the price tag! The gorgeous beaded Holly earrings are very similar to Pippa’s (but without the €400 price tag! ), and a great way to up the glamour stakes. The earrings are available in nine different colours, so will add a pop of colour to your outfit and will stand out even if you decide to wear your hair down instead of doing the usual updo. And, they’re clip-on, so easy on the earlobes! The shorter-length Alexa earring is equally as stunning with its gold-plated stud embellished with clear crystals. This earring lends itself also to more casual occassions, but is still statement-making & fabulous! The tassels are available in four colours, and have a flattering, neck-elongating effect to boot! With such stunning earrings, you don’t need to worry about any other accessories. Keep it simple, you’ve already made your statement! You've probably seen a dreamcatcher in a giftshop and wondered about its purpose and meaning. Originally created by American Indians, dreamcatchers come in a variety of different sizes and styles, but usually consist of a small wooden hoop covered in a net of meaningful sacred items such as feathers and beads hanging down from the bottom of the hoop. The shape of the dreamcatcher is a circle because it represents the circle of life. The dreamcatcher web is believed to catch bad dreams during night and dispose of them when the sun rises. As for the good dreams, the feathers act as a fluffy, pillow-like ladder allowing them to gently descend upon the sleeping person undisturbed. Now, you can see why people like them so much! The Dreamcatcher collection from Azuni London was inspired by this symbolish and is hand crafted by indigenous native Americans. The hand-beaded pieces are lovingly woven from colourful glass seed beads and crystals. With beautiful colour combinations and patternation, fusing present and past, the pieces are perfect for adding a splash of colour to an outfit, or giving your look a boho vibe during festival season! July is the month of the zodiac signs Cancer & Leo. Famouns July alumni include Liv Tyler, Tom Cruise, Sylvester Stallone, Tom Hanks, Arnold Schwarzenegger, and Jennifer Lopez. Quite a formidable bunch! The stone associated with July is the Ruby. Rubies are said to arouse the senses, stir the imagination, and to guarantee health, wisdom, wealth, and success in love. Who wouldn't want some of those! It was once believed that wearing a fine red ruby brought good fortune upon its owner. Well, it's worth a shot, eh? Little jewellery factoid for you - rubies and sapphires are actually from the same gemstone family, Corundum, the only difference being their colour, so the green Sapphire is Emerald and the red sapphire is Ruby. That's one for the pub quiz! The stone associated with Aquarius is the Amethyst. Amethyst was believed by ancient Greeks and Romans to ward intoxication, also is said to keep the wearer clear-headed and quick-witted. In fact, the word amethst comes from the Greek word “amethystos” meaning “not drunk". There's an interesting fact for when you're down the pub! Throughout history, the gemstone has been associated with many myths, legends, religions, and numerous cultures. Amethyst is basically purple quartz and can found throughout the world. In the past, Russia was regarded as the best source of fine amethysts which were used in a lot of royal European jewellery. Nowadays, Brazil is the main source, followed by Zambia. We don't know if that's true, but I'm sure there are a few heads nodding in agreement out there! The stone associated with Capricorn is the Garnet. The word "Garnet" actually means deep red, although the stone can be found in in many colors including red, orange, yellow, green, purple, brown, blue, black, pink, and even colorless, however the reddish shades are most common. The Garnet type used in jewellery is mostly sourced from America, China, and India. "As I was attending Longitude this weekend I’ve been scouring the internet for festival hair, beauty and accessories inspiration! Festivals are the perfect time to experiment and try out daring make-up or a new hair style. I love the French braid pigtails trend and really want to try this out! It looks particularly good if you have balayage or dip-dyed hair. For extra cool hair you can add a temporary dip-dye like those from Bleach London if you’re blonde…word to the wise these colours only show up in bleach blonde/light blonde hair, they will not show up in brown or dark blonde hair! I know because I tried to colour my dark blonde ends! For festival make-up I love glitter, face jewels and fluorescent face paints! Festivals are your one chance to wear whatever the hell you want and there’s no such thing as make-up that’s too crazy or colourful. Metallic tattoos like these from ShimmerTatts on Etsy are the best festival accessory. But if you prefer some lasting sparkle, Aquaruby have beautiful jewellery ideal for festivals. Their Daisy London range has gorgeous gold-plated necklaces and pendants just crying out to be worn! These beautiful Kendra Scott earrings are really unusual and would compliment any festival outfit." To read the full article, and more fashion articles from Edel, hop over to her blog joyofblogs. We were absolutely delighted when our first Catherine Weitzman delivery arrived, having had an eye on our collection for quite some time, and having met the designer herself and seen her beautifully delicate jewellery for the first time in New York. Catherine has always had a deep love of jewellery and worked under several US designers after completing her study of jewellery making and metal-smithing. However, it was her five-year adventure around the globe that would inspire her to start her signature line of handmade jewelry. In 2004, Catherine moved to Hawaii and built a studio where all the jewellery is still handmade today. The Hawaiian influence factors hugely in how she runs her business, through the use of found objects, recycled metals and responsible suppliers. The delicate pieces capture the true essence of Hawaiian life with beautiful starfish, birds, feathers, and branches featuring heavily in the collection, enhanced with tiny semi-precious stones such as aquamarine, apatite, rubies, and sapphires. We're always excited whenever we add a new designer to our range. One which came to us quietly at the end of last year, and has since then blown us away with its beautiful, intricate designs, use of gemstones, and above all its inspirational meanings, is Satya Jewelry. Satya means truth in Sanskrit and evolved after 30 days of intensive yoga training in the Bahamas, when Satya - the founder of the collection - was given her spiritual name, Satya meaning truth. That evening, she became inspired to start a new business with her best friend Beth, to create jewellery that is not only beautiful but meaningful and inspiring, while at the same time donating to children's groups throughout the world. The Satya customer may be attracted to a particular symbol that resonates with them, or to the healing property of a particular gemstone. Each piece is lovingly made to inspire and empower the wearer to be the best they can be. After over twelve years in business, Satya and Beth are still designing stunning jewellery and have continued to run their foundation which has raised over $1 million for international children's charities. Here's Satya discussing why her collection has become such a success with women all over the world. Unless you've been living on a different planet, you won't have missed the phenomenon that is Disney's Frozen. Inspired by the fairy tale The Snow Queen, the film tells the story of Elsa, the fearless princess and her epic journey with Olaf the snowman in her seach to reunite with her estranged sister, Anna. Frozen has become the fifth highest grossing film, and the highest-grossing animation film of all time, notching up over $1.2 billion at the box office, and an Oscar winning soundtrack "Let it Go" to boot. So it was inevitable that a Disney Couture jewellery collection inspired by Elsa's epic journey would land at our doorstop at some stage, and finally it has! The Frozen collection features Anna, Elsa and Olaf, as well as wintery imagery, set on 14kt white gold plated pieces. The Disney Couture collection has been designed with both younger and adult Frozen fans in mind, with the bracelets coming in two sizes, and the necklaces having adjustable lengths. We have been so excited about the arrival of this collection, which our customers are just raving about it. In fact, it's almost impossible not to launch into a chorus of "Let it Go" everytime we get an order. This is one Disney Couture collection that's sure to be under many Christmas trees this year! 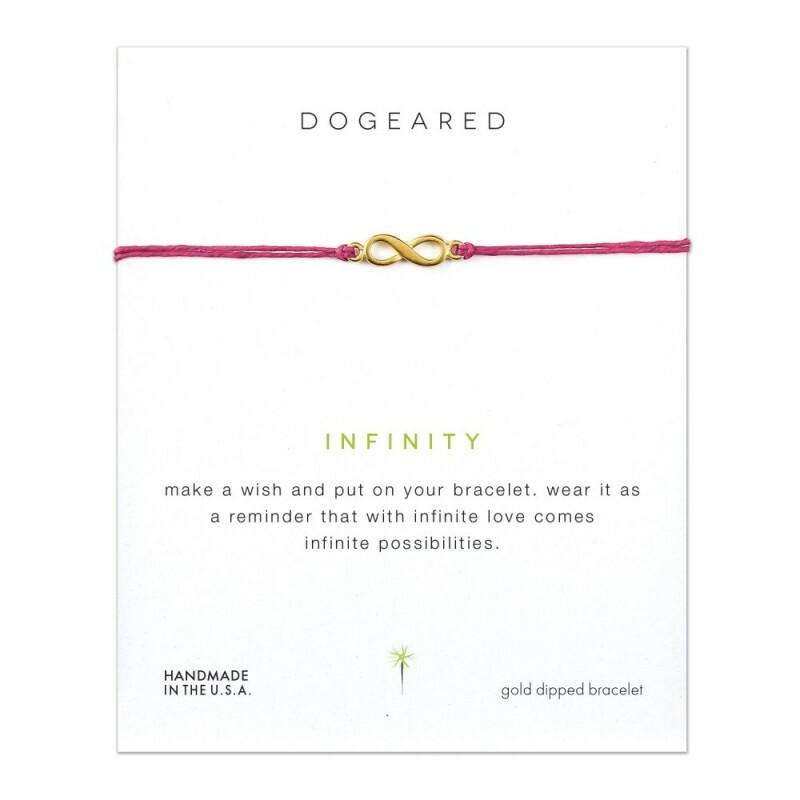 Our Dogeared Bracelet collection is ever-expanding! We love these bracelets - they are beautifully delicate, can be layered up with other bracelets, and inject a pop of colour into your look! Teamed with a simple white t-shirt and jeans, you get to make the rest of the look your own! Each bracelet comes with an inspirational message, to help spread even more positive energy! Why not browse the Dogeared bracelet collection now? It's official: We love Pharrell! Dogeared was founded upon the idea that jewellery can be made and worn in such a way that it spreads positive energy into the world. So it was a natural progression that they have gone on to develop a collection that captured the essence of this energy and the positive power it can have on an individual. 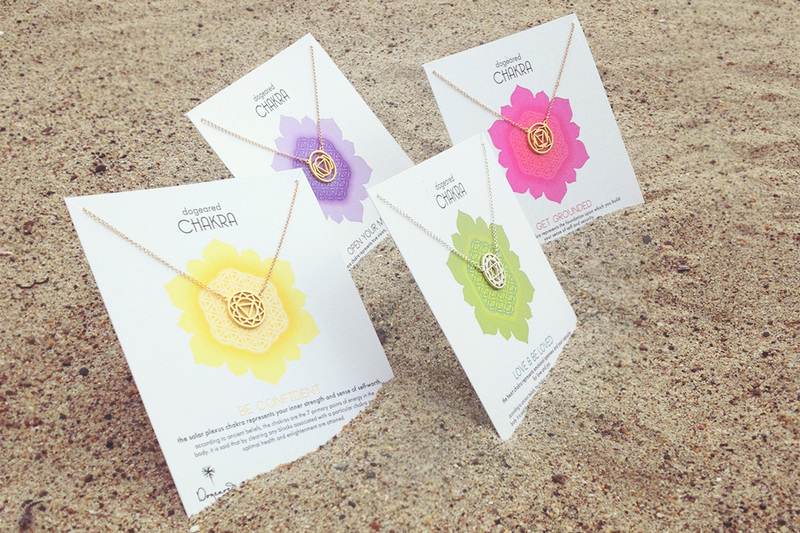 We are therefore delighted to introduce the new Dogeared Chakra Collection! In life, in order to achieve the happiness and serenity we strive for, we need to have our minds and bodies in balance. According to ancient beliefs, the key to connecting mind and body lies in the 7 primary points of energy… Chakras. When these Chakras, each with symbolic, corresponding colors which run along the length of the spine, are enabled to work harmoniously, our bodies become healthier, clearer and more vital. Chakra work helps to open any of your energy centers that are keeping you from achieving optimal health and enlightenment. It is said that by clearing any blocks associated with a particular chakra point, optimal health and enlightenment will be achieved. Dogeared Chakra necklaces are designed to bring balance to those who wear them by choosing the corresponding the necklace corresponding to the Chakra which needs to be strengthened. Dogeared's message is "Live life fearlessly and wear your chakra daily as a reminder of your life’s journey". Hmmm so which Chakra will it be? Lola Rose SS14 Collection has arrived! Twice a year, there is always a flurry of excitement in Aquaruby HQ when the new season Lola Rose collection arrives! This season, does not disappoint! There are some beautiful semi-precious stones returning from previous seasons such as bamboo stone, blue howlite, black stripe jasper, and capri green quartzite, but also the introduction of some stunning stones like flower agate, pink grace quartzite, rock crystal, and seafoam quartzite. Now embellished with gold tone Lola Rose hangtags, the pieces are even more collectable! The flower agate range is proving to be extremely popular with its beautiful unique markings and patterning. However, for us pink grace quartzite with its gorgeous coral-pink hue is sure to be a winner this season, and perfectly evokes feelings of sunny spring days and warm summer evenings! Time for winter to end, methinks! Getting the celebrity look just got easier for our Irish customers! We are proud to announce the launch of a dedicated Irish website, aquaruby.ie, giving all its Irish customers free shipping. The launch coincides with the launch of our newly-designed website which we hope you all like. Spring is here, the sun is finally out and we are feeling ultra-girly so there's nothing for it but to get our pink on! Don't get us wrong, we love over-sized statement earrings around here. Nothing transforms an outfit so easily from day to evening like a pair of über-glam shoulder scrapers. However, there are occasions in life when a more subtle earring is required. Enter the unassuming stud. The stud earring is the jewellery equivalent of the Mini Cooper - small, comfortable, practical, yet oh so stylish. The stud has come a long way since its humble beginnings as the entry-level earring of the newly pierced teenage ear. Today, the choices are endless with each designer jewellery collection containing a least one must-have pair. The collection features gorgeous delicate pastel stones such as powder blue, capri green, lemon sorbet, pink blush and apricot quartzite. Contrasting these pastels are the darker midnight quartzite (a possible future rival in popularity to the best-selling blue sandstone) and the hugely popular multi grey agate which has been flying off our shelves. Our Lola Rose Spring Sale ends at midnight on March 31st but we've put together a few of our favourites in this short video. We hope you love the collection as much as we do! Each month, we pick one of our designers and put them centre-stage. For the month of February, we have chosen Daisy! Daisy began on Portobello Road in London 40 years ago, however, it's true popularity took off four years ago when James Boyd took over the helm of the company and created the now iconic Chakra bracelet. The chakra bracelet has achieved a loyal following among celebrities and fashionistas alike, with fans spanning from Sienna Miller to Kanye West. Since then, the collection has expanded far beyond chakras and includes exquisite sterling silver bracelets, necklaces, and earrings. We love the new year for the beginning of the awards season. 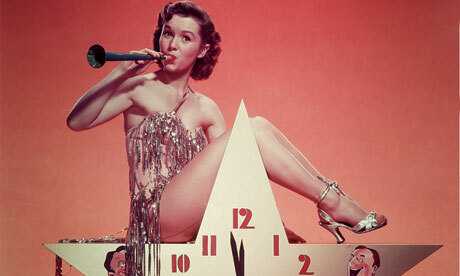 All those ultra-glam frocks and stunning jewellery somehow help to brighten up that post-Christmas lull. Last night's Golden Globes did not disappoint. With a stunning spectrum of colours and looks, competition for best-dressed was rife. But there can only be one winner, and for us the award goes to...Jennifer Lawrence in Christian Dior accentuated with metal belt and clutch bag. Sadly for every winner there has to be a loser (a bit harsh, we know) and for us that was the-up-until-now-pretty-darn-faultless Sienna Miller in an Erdem two-piece. It was all just a little bit too flowery, shapeless, and effortless (but not in a good way!). C'mon Sienna, we know you can do better! It is fair to say that we absolutely love blue sandstone! 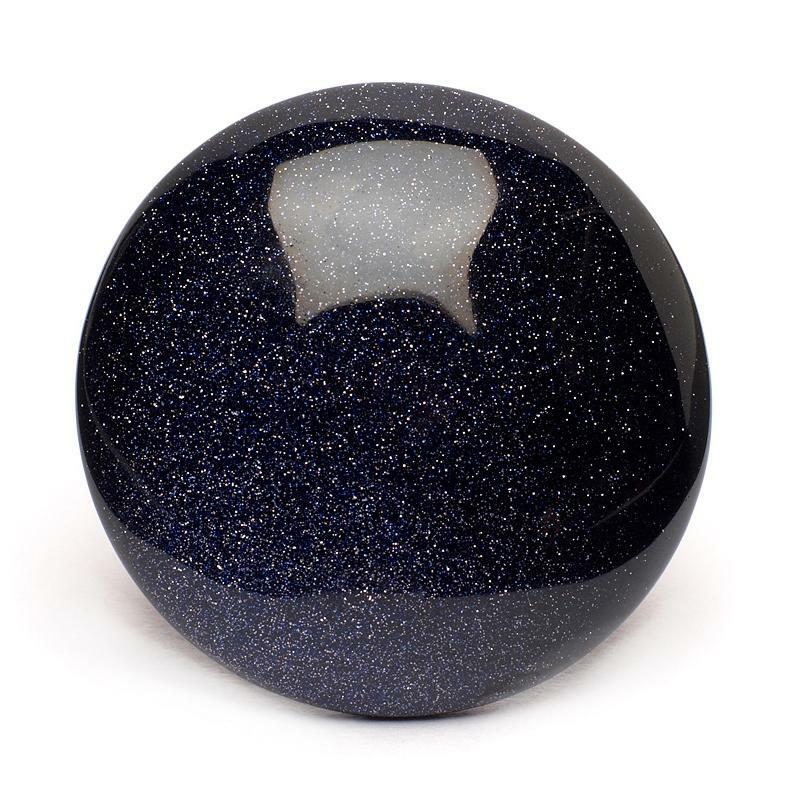 This beautiful stone has a beautiful sparkly quality reminiscent of a dark, starry sky. It is no wonder then that Lola Rose use this stone in every single collection and is, by far, one of their bestsellers. Here is a short video of some of our favourite Lola Rose blue sandstone jewellery. Hope you enjoy it! What goes around, comes around! It's no wonder then that celebrities love some good karma. The Dogeared Karma necklace is now celebrating 20 years and is created in the spirit of love, kindness, and consciousness. It has been seen on numerous TV shows and is beloved of the queen of talk herself, Oprah Winfrey. Wearing or giving some good karma as a necklace or bracelet is the perfect way to spread some positive energy! Here are just some of our favourite pieces from Dogeared and Daisy. Summer is coming and that means the right to bare arms! So it's time to adorn those limbs that have been kept under wraps all winter and there's no better way than to get stacking! It's a trend that's here to stay and the simplest way to put your unique stamp on an outfit. 1.Don’t be afraid to stack on both arms or limit the amount of bracelets you wear. 2. Keep the rest of your jewellery to a minimum to give the look maximum effect. 3. Use a chunkier cuff or bangle as the centre point of the stack. Mixing widths makes the look more interesting and acts as an anchor for the other thinner bracelets. 4. A variety of contrasting colours looks great with a simple vest top and jeans or summer dress. 5. Mix in charity bracelets or friendship bracelets that have a special meaning to you. 6. For an edgy look, mix metal bangles with leather wrap bracelets. 8. Go glam with a mixture of gold and crystal bracelets. This look was big this year's Golden Globes and Oscar's. 9. Trial and error. Try out different textures and colours and see for yourself which looks best. This trend doesn't take itself seriously, so have fun and get stacking! 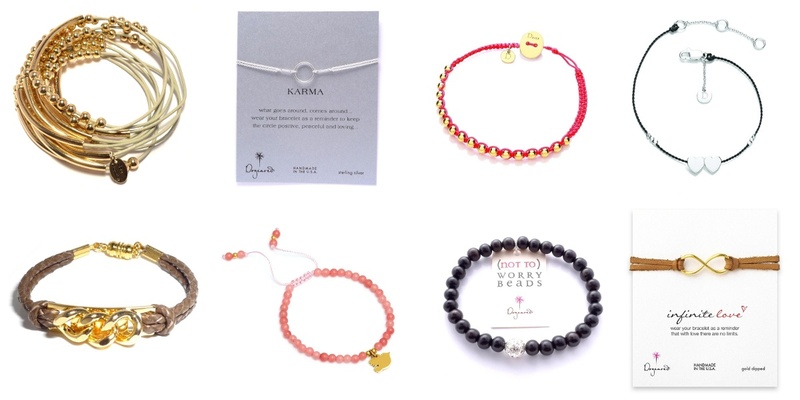 Bottom row (L-R) Vita Fede Veronica Leather Bracelet, Lola Rose Tilda Coral Quartzite Bracelet, Dogeared Not to Worry Bracelet, Dogeared Infinite Love Bracelet. 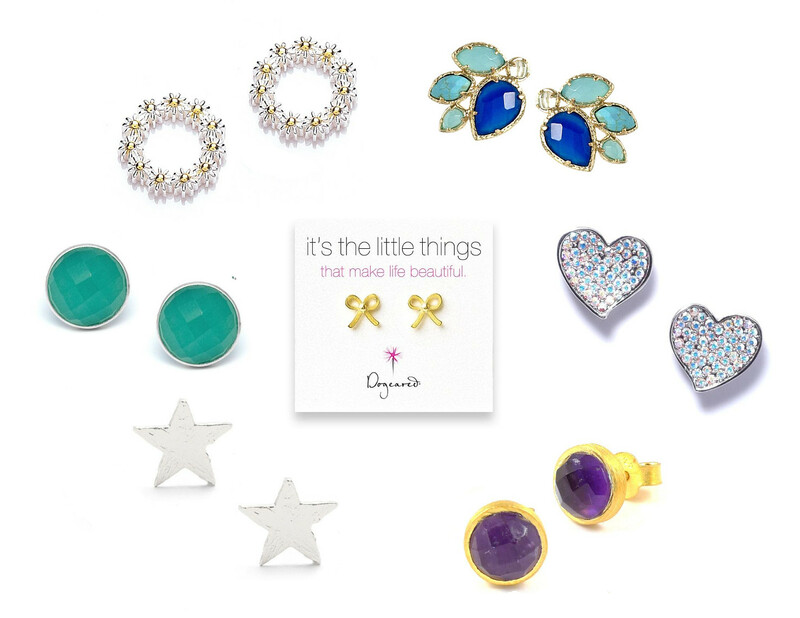 Last year, we discovered the US jewellery designer Kendra Scott and boy, are we glad we did! Kendra Scott is a colourful and bold collection of fashion jewelry that offers bracelets, necklaces, earrings, and rings in a whole spectrum of vivid colours. Her pieces are perfect for adding an instant splash of colour and glamour to any outfit, day or evening, and her line of jewellery enjoys a string of loyal celebrity followers including Paris Hilton, Sofia Vergara and Eva Longoria. Kendra began her own line of jewellery out of the extra bedroom of her home in Texas in 2002 with only $500. Since then, her company has grown into a global multimillion dollar corporation. Her jewellery regularly features in magazines such as InStyle, Allure, and US Weekly. Kendra has also collaborated with leading fashion designers Oscar de la Renta and Randolph Duke, who have featured her as their accessories designer for their runway collections. In addition to her flagship store in Austin, there are two additional Kendra Scott stores in Dallas and Beverly Hills. It's that time of the year when us girls can truly bring out the inner diva! The New Year's Eve Party. No other event in the year tops it for pure unapologetic glamour. It's the night to get out the highest you'll-pay-for-it-tomorrow heels, your shortest sequinned dress (or hey, why not go red carpet long) and put on your boldest and blingiest jewellery which you store away all year for fear of being too showbiz. This is the night to pull out all the stops, lose all inhibitions, and be a star for the night. The next day, you get to press the reset button of life and make a fresh start into 2012. 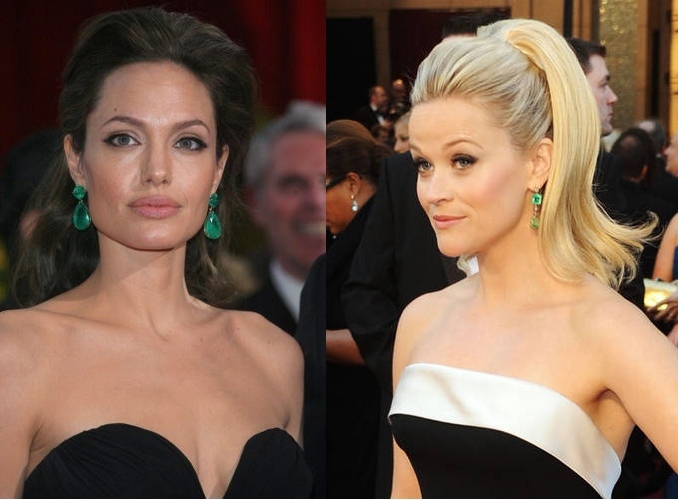 Ask anyone what jewellery they remember from the Oscar's and most people will undoubtedly say the stunning Lorraine Schwartz emerald earrings worn by Angelina Jolie in 2009. More recently, Reese Witherspoon donned some amazing Neil Lane emerald sparklers at last year's awards. Both ladies kept their look elegant by keeping their neck line clear of distracting jewellery and let their earrings do all the talking. And therein lies the key to this look! No other colour can give such instant wow than green. But overdo it and the effect is lost. It's a style that translates well into day by instantly transforming a simple, plain work-wear outfit into something special and unique. So keep it simple this party season. Slip on your favourite LBD, add some va-va-voom with a pair of fabulous statement green earrings, roll out the red carpet and you're good to go! Lola Rose jewellery is constantly featured in fashion bibles throughout the world, and has been spotted on various style icons: Sarah Jessica-Parker, Kate Middleton (who was famously bought a signature Lola Rose heart pendant by Prince William), Halle Berry, Claudia Schiffer, and Dannii Minogue, to name but a few. 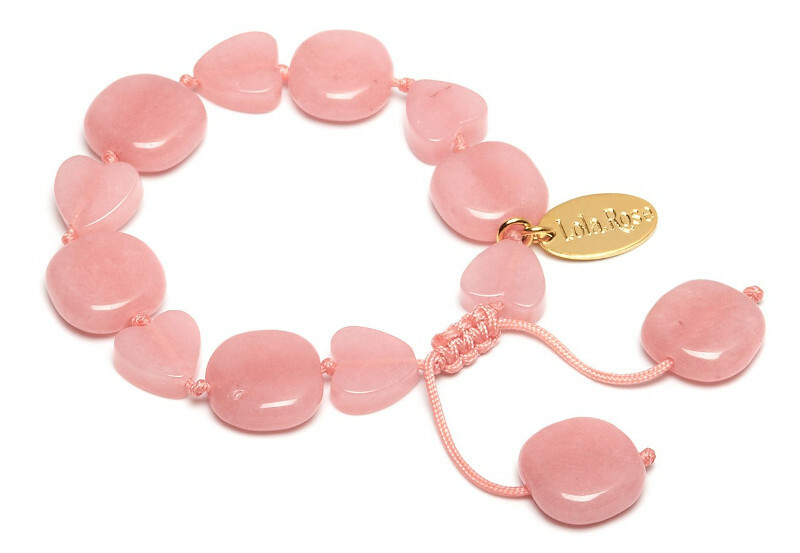 The Lola Rose label was founded by London based jewellery designer Nicola Gerwitz who created her first tumble bracelet in 2000 which was snapped up by stores such as Fenwicks of Bond Street, Harvey Nichols and Liberty. Since then the brand has gone from strength to strength and has become one of the most respected brands in fashion jewellery. The brand has attracted a devoted following with fans adding to their Lola Rose collection every season. Each season brings together a stunning array of semi-precious stones such as blue sandstone and grey agate transformed into stunning pieces which look great matched with evening attire, as well as with less formal wear for the day. The philosophy of Lola Rose is "affordable luxury" - allowing you to treat yourself to something special without breaking the bank. Perfect for every recessionista! Nonetheless, the quality of the jewellery in addition to the uniqueness of the semi-precious stones is outstanding and certainly worthy of a much more expensive price tag! Lola Rose jewellery is an absolute must-have this season, either as the perfect gift or on your own Christmas wish list! It's that time of year again when not only kids get the opportunity to do a bit of dress up. So how do you introduce a bit of festive flair into your outfit without frightening the neighbours? Well look no further than the master's of sparkle, Butler & Wilson. There are great pieces to choose from - spiders, lizards, serpents and the ubiquitous skulls. The Swarovski crystals used to embellish these stunning pieces act to make them less goth and more glam! So go on, bring out your dark and mysterious side this month. Happy Hallow'een everyone! Instant Glam in a Bag! Paloma Picasso, in an interview for the September edition of Vogue (have we mentioned already that we were featured in Vogue? Yes? OK, moving on then...) advises "Always keep a couple of pairs of earrings in your bag in case you suddenly need to give your outfit a lift." Genius! As every woman knows, handbags were designed to store and transport those "you never know" and "just in case" items - safety pins, a bent paperclip for emergency manicures, plasters, aspirin, tissues, Vaseline (or if you're really posh - Elizabeth Arden 8 hour cream)..., so why not add a couple of shoulder grazers to the collection? A pair of statement earrings (and this season is all about statement earrings dahling!) can transform an outfit instantly whether it's some XL hoops a lá Jennifer Lopez, or some elaborate door knockers a lá Beyonce! Butler & Wilson had its humble beginnings on a market stall on the King's Road when two young friends Nicky Butler and Simon Wilson first began selling antique jewellery from their stand. Forty years on, with Simon still at the helm, the stunning designs of Butler & Wilson can be found at the flagship store on the Fulham Road in London, in London's West End, and several concessions throughout the world. 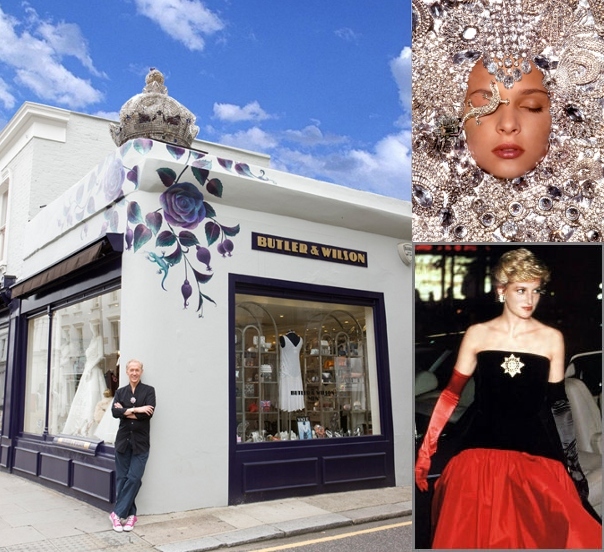 Over the years, stars such as Jerry Hall, Catherine Deneuve, Faye Dunaway and most famously Princess Diana have adorned themselves with the elaborate creations of Butler & Wilson. A collection for Armani, as well as for the infamous Pirelli calender have meant that the brand has stayed in the public eye. With its position as the glamour go-to brand for photo shoots, as well as endorsement from celebrities such as Madonna and Kylie Minogue, the brand has maintained a powerful following among today's glamour seeking generation as can be confirmed by a visit to either of their London stores. Meeting Simon Wilson, it is evident why the brand has survived for over 40 years. His youthful appearance, despite having reached the age of retirement , coupled with his energy and enthusiasm show no signs of relenting, insuring that we have decades of unadulterated glamour to look forward to. "From the very beginning we never did subtle" says Wilson. So why should we? Here is a short video homage to Butler & Wilson. Hope you enjoy it!